Camping & lodging facilities located just outside Sacramento, nestled in the Historical Gold Discovery Foothills. Tour the mines at the famous Gold Bug Park, walk through Old Hangtown, or visit the Marshall Monument in Coloma. Enjoy Apple Hill, Wineries, Golfing, White-Water Rafting, or even Ski the Sierra's. Reserve one of our Camping Cabins for the ultimate Red Hawk Casino experience! At any point you can dial up the Red Hawk Casino's free shuttle and within minutes be enjoying their unbeatable dining, entertainment, or gambling offerings. The Red Hawk also offers a large Cyber Quest Arcade & Kids Quest hourly child care. Our campground facilitates just about every size or type of RV there is. We offer full hookup pull throughs, 30-50 amp service, deluxe sites with patios, cable tv, wireless internet, you name it! "Roughing it" is now a thing of the past when staying in one of our shady electric tent sites. Rent one of our little tv/dvd combos and select one of the hundreds in our dvd collection for an evening of relaxation! Tent campers also have access to our Kamping Kitchen for cooking, cleaning, playing games, or whatever they should feel like. 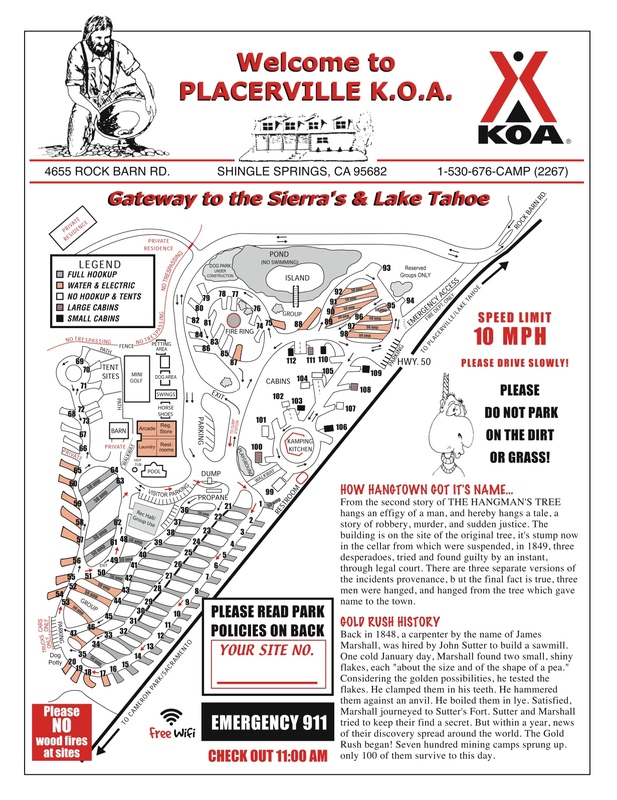 We invite you to take a look around our site to see all the many features, amenities, & local attractions that the Placerville KOA has to offer. Come see us soon!!! Join us this fall for the county's famous Apple Hill festivities! Apple Hill is one of El Dorado County's biggest attractions! Boasting of over 50 ranches and orchards including wineries, a micro-brewery, spa, and vineyards. Every year thousands of visitors travel great distances to enjoy the festivities! We always have an fun selection of cost saving hot deals for our park. Please click here to check out our latest offerings!